Preparation of the ligands HL1 = 2,6-[(N-phenylpiperazin-1-yl)methyl]-p-ethylphenol; HL2 = 2,6-[(N-phenylpiperazin-1-yl)methyl]-p-methoxyphenol and HL3 = 2,6-[(N-phenylpiperazin-1-yl)methyl]-p-nitrophenol are described together with their Cu(II) complexes with different bridging units. The exogenous bridges incorporated into the complexes are: hydroxo [Cu2L(OH)(H2O)2](ClO4)2.H2O (L1=1a, L2 =1b, L3 =1c), acetato [Cu2L(OAc)2]ClO4.H2O (L1 =2a, L2 =2b, L3 =2c) and nitrito [Cu2L1(NO2)2(H2O)2]ClO4.H2O (L1=3a, L2 =3b, L3 =3c). Complexes1a,1b,1c and2a,2b,2c contain bridging exogenous groups, while3a,3b,3c possess only open μ-phenolate structures. Both the ligands and complexes were characterized by spectral studies. Cyclic voltammetric investigation of these complexes revealed that the reaction process involves two successive quasireversible one-electron steps at different potentials. The first reduction potential is sensitive to electronic effects of the substituents at the aromatic ring of the ligand system, shifting to positive potentials when the substituents are replaced by more electrophilic groups. EPR studies indicate very weak interaction between the two copper atoms. Various covalency parameters have been calculated. The ligand 1,4-dibenzoyl-3-thiosemicarbazide (DBtsc) forms complexes [M(DBtsc-H)(SCN)] [M = Mn(II), Co(II) or Zn(II)], [M(DBtsc-H) (SCN)(H2O)] [M = Ni(II) or Cu(II)], [M(DBtsc-H)Cl] [M = Co(II), Ni(II), Cu(II) or Zn(II)] and [Mn(DBtsc)Cl2], which have been characterized by elemental analyses, magnetic susceptibility measurements, UV/Vis, IR,1H and13C NMR and FAB mass spectral data. Room temperature ESR spectra of the Mn(II) and Cu(II) complexes yield &lt;g&gt; values, characteristic of tetrahedral and square planar complexes respectively. DBtsc and its soluble complexes have been screened against several bacteria, fungi and tumour cell lines. Indium (III) is precipitated with oxalic acid in the presence of potassium nitrate maintaining an overall concentration of 0·125 M in HNO3. Chemical analysis of the complex salt obtained indicates the formula, K[In(C2O4)2]·3H2O. Thermal decomposition studies show that the compound decomposes first to the anhydrous potassium indium oxalate and then to the final mixture of the oxides through formation of potassium carbonate and indium (III) oxide as intermediates. Isothermal study, X-ray diffraction pattern and IR spectral data support the proposed thermal decomposition mechanism. 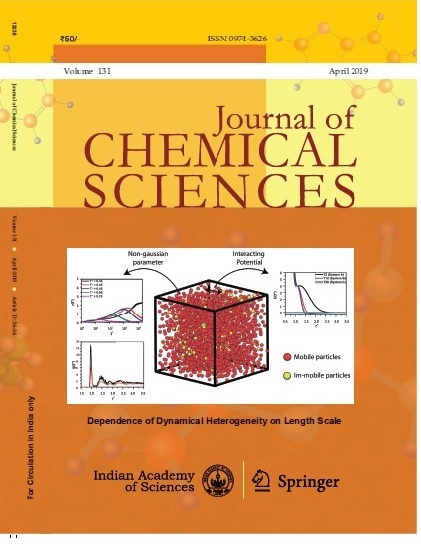 A novel dinucleating pentadentate Schiff base, resulting from the condensation of 2,6-diformyl-p-cresol and N-methyl-indolyl-3-thiohydrazide, and its Zn complex have been prepared and characterized on the basis of elemental analysis, IR, UV-Visible,1H NMR and13C NMR studies. The ligand is acyclic and consists of a phenolate head unit, with two inbuilt azomethine shoulders and two indole thiohydrazide arms forming SNONS coordinating sites. NMR and IR spectral studies show that the ligand exists in thioketo form. Each Zn ion in the dinuclear core is in tetrahedral environment with endogenous phenolate bridging and exogenous acetate bridging. The zinc complex in DMF exhibits fluorescence. α, N-diarylnitrones were synthesized by the reduction of a mixture of nitro-and benzaldehyde derivatives with zinc dust using histidine as a catalyst. Semiempirical SCF-MO studies of tautomerism in alloxan preclude the possibility of direct proton transfer in the gas phase due to the strain in the four-centred transition state, in which the proton being transferred is forced to come close to the positively charged carbon atom at the opposite corner of the four-membered ring. However, in aqueous solution, the activation barrier reduces appreciably, not only due to reduction in strain, but also due to charge separation in the transition state, which is stabilized due to ionic resonance. The N-H bond is almost broken, while the O-H bond is only partially formed in the transition state. The other stabilizing effect in aqueous solution is due to bulk solvent dielectric effects, which stabilize the transition state to a greater extent due to its higher dipole moment. Although the transition states for proton transfer to the neighbouring oxygen atoms on either side have comparable energies, as the mechanisms of proton transfer leading to the formation of the 2-hydroxy and 4-hydroxy tautomers are similar, bulk solvent effects are larger in the latter due to the higher dipole moment of the transition state. The reason is the almost complete separation of the two entities, i.e. the alloxan anion and the hydronium ion in the latter case, indicating that in this case a dissociative mechanism of the kind encountered in acid-base equilibria is operating. Detailed X-ray crystallographic investigation of the reactive α- and the unreactive γ-polymorphs ofo-ethoxy cinnamic acid has been carried out along with that of the photodimer, α-truxillic acid. The molecule is quite planar in the α-form, but in the γ-form, the side groups deviate significantly from the plane of the benzene ring. The carboxylic groups form normal cyclic hydrogen bonds in the α-form and near-symmetric hydrogen bonds in the γ-form. The infrared spectrum of the α-form shows the characteristic features of the cyclic dimer, but that of the γ-form is entirely different, marked by the absence of the O-H stretching band in the 3000 cm-1 region. Charge density analysis throws some light on the structure and reactivity of the molecule in the two forms. The near-symmetric hydrogen bond in the γ-form is ionic and appears to restrict conjugation by way of distorting the molecule. This unusual feature keeps the cinnamoyl double bonds away from each other, rendering it photochemically unreactive. In the α-form, however, the double bonds have a closer approach. The cyclobutyl ring of the photodimer consists of weak single bonds, with the new pair being slightly longer. Kinetics of oxidation of acidic amino acids (glutamic acid (Glu) and aspartic acid (Asp)) by sodium N-bromobenzenesulphonamide (bromamine-B or BAB) has been carried out in aqueous HClO4 medium at 30°C. The rate shows first-order dependence each on [BAB]o and [amino acid]o and inverse first-order on [H+]. At [H+] &gt; 0·60 mol dm−3, the rate levelled off indicating zero-order dependence on [H+] and, under these conditions, the rate has fractional order dependence on [amino acid]. Succinic and malonic acids have been identified as the products. Variation of ionic strength and addition of the reaction product benzenesulphonamide or halide ions had no significant effect on the reaction rate. There is positive effect of dielectric constant of the solvent. Proton inventory studies in H2O-D2O mixtures showed the involvement of a single exchangeable proton of the OH− ion in the transition state. Kinetic investigations have revealed that the order of reactivity is Asp &gt; Glu. The rate laws proposed and derived in agreement with experimental results are discussed. Dissociation of nitromethane has been observed when a mixture of CF2HCl and CH3NO2 is irradiated using pulsed TEA CO2 laser at 9R (24) line (1081 cm-1), which is strongly absorbed by CF2HCl but not by CH3NO2. Under low laser fluence conditions, only nitromethane dissociates, whereas at high fluence CF2HCl also undergoes dissociation, showing that dissociation occurs via the vibrational energy transfer processes from the TEA CO2 laser-excited CF2HCl to CH3NO2. Time-resolved infrared fluorescence from vibrationally excited CF2HCl and CH3NO2 molecules as well as UV absorption of CF2 radicals are carried out to elucidate the dynamics of excitation/dissociation and the chemical reactions of the dissociation products. With the aim of finding a suitable electrocatalyst for the efficient reduction of carbon dioxide, the electrochemistry of nickel (II) complex of 1,3,6,9,11,14-hexaazatricyclo [12·2·1·1] octadecane was studied using cyclic voltammetry (CV) and controlled-potential electrolysis (CPE) techniques in the presence and absence of CO2 in 100% H2O, CH3CN-H2O mixtures (20–100%) and DMF-H2O (70–100%) mixtures. The efficiency of this process is determined using the coulometry technique. CO is the major product in the gaseous phase and HCOOH the sole product formed in the solution phase.